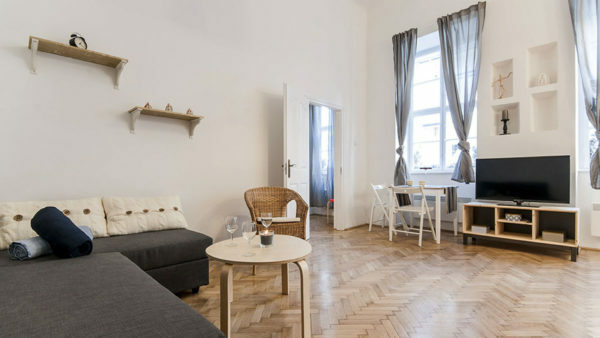 Elementary base for you in Budapest, just like the black pepper in food! The apartment is located on the 1st floor and the house has a very nice garden with a little pond. Even though it is situated in one of the busiest areas, the apartment is very quiet, as it resides on the inner part. The flat is ideal for youngsters, couples, groups of friends and families. The apartment consists of 2 separate rooms: one bedroom with a double bed, a living room with a convertible sofa-bed, cupboard and a dining table. There is a well equipped kitchen (oven, fridge, microwave, kettle, toaster etc…), a bathroom with bathtub and toilet. Curtains up! Welcome in the neighbourhood of the theathers: the Operett Musical, Thalia and Radnoti Theater is just next to the flat! No to mention the best restaurants, clubs, bars and ruinpubs. Near or far? No problem at all, just take the Continent’s oldest underground and you can reach any part of the city. Come and enjoy! The closest metrostop is the Opera on M1.